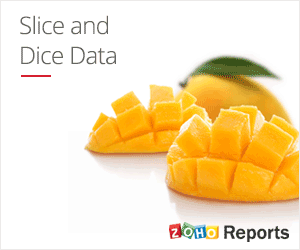 Zoho Reports is an online reporting tool that helps you gain insight into your business. Better still, it now comes with a new and improved interface and fucntionality in the form of Zoho Reports 3.0! Quickly and easily upload spreadsheet data in CSV, TSV, XLS and HTML format. Alternatively, add data directly using the Zoho Reports spreadsheet interface. Transfer data from your hosted or in-house business solutions to Zoho Reports for web based reporting and analysis. Create real time reports on the fly with an easy drag and drop interface. No IT help required! Make use of a wide variety of charting tools and components to build your reports. Develop detailed business reports online, share, collaborate and analyse them online with colleagues and management. Get the right business intelligence to the right people at the right time. Embed your Zoho Reports anywhere, including blogs, web pages and other web application as well as your corporate intranet, created using Zoho Wiki! Create SQL queries to perform powerful reporting functions to give you accurate online business intelligence reporting. No need to worry about your data, Zoho Reports supports secure encrypted connections. Zoho Reports is a powerful, affordable on-demand business analytics solution that helps you perform complex business reporting and analysis. Here are 8 reasons why it makes sense to use Zoho Reports as a key component of any business data analysis and decision making process. Zoho Reports has a short learning curve and users do not need much learning time to get up to speed. If you are familiar with using spreadsheets, you will learn Zoho Reports in no time. Simply import, upload or push CSV (Comma Separated Value) files, XLS files or indeed files of any spreadsheet format. Zoho Reports will generate reports automatically. This means IT departments do not need to get involved and can focus on other important areas. Zoho Reports has a very user-friendly interface with drag and drop features being the norm. It offers dashboards, charts, pivot tables and tabular reporting options that help you easily perform standard business intelligence analytics. Pivoting (or Crosstabs), querying using SQL in all major database dialects, filtering, drill-down and extensibility with Application Programming Interface (API) make Zoho Reports a more powerful and flexible business intelligence analytics software online. Typically, business analytics software are very restrictive as far as collaboration is concerned. Zoho Reports allows you to share tables, dashboards, charts and reports with your team. Its fine-grained access control system lets you share a table, dashboard, chart or any report with read, write, export etc., permissions. It allows a group of people do collaborative analysis i.e., work on the same data, analyze it and generate reports to arrive at a collective result quickly. You can also easily publish any report created, which is live and accessible over the web. As with all other Zoho online business solutions, Zoho Reports comes as ‘software as a service’. All you need to use it are a browser and internet connection and you can use it any time, anywhere. In addition, there are no hardware requirements and free support! Data security is of the utmost importance. All data is hosted in highly secure data centres, with controlled access and other physical security. See our FAQ for more information. Access to your data and reports is via username and password. Zoho Reports also supports HTTPS (SSL connection). Unlike other typical business intelligence reporting tools, which are expensive and costly to implement, Zoho Reports comes in a free edition with ample features. Fully featured licensed version come in several very affordable plans. Contact us here or at info@crmasiasolutions.com for more information on pricing. As a Zoho Reports user you are actually using one of a comprehensive suite of web-based business applications that range from document management and project management solutions to CRM to email. The Zoho Business Suite can consolidate as many of these as you need into one business portal for your entire business organisation. Convinced Zoho Reports will satisfy your business intelligence and analytics needs? Need more details? Want a quotation? Contact or chat with us here, or via email on info@crmasiasolutions.com. We now have a very detailed insight in our daily sales figures without any manual operations.